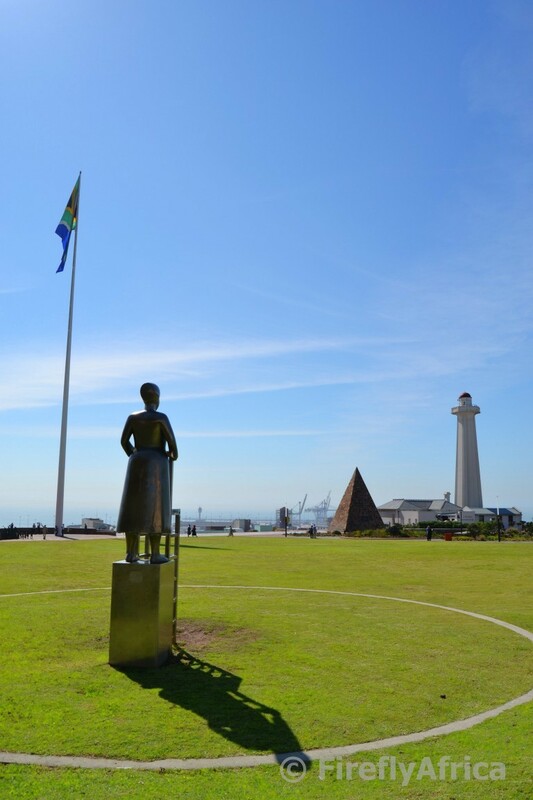 I often wish I had a drone to be able to shoot some aerial views of all the fantastic places and attractions around Port Elizabeth. Check out this awesome video I found on YouTube showing off PE from the air done by Jayme Thompson in collaboration with Indian Swell Productions and Jared Lotz. PEness is AWESOMEness. 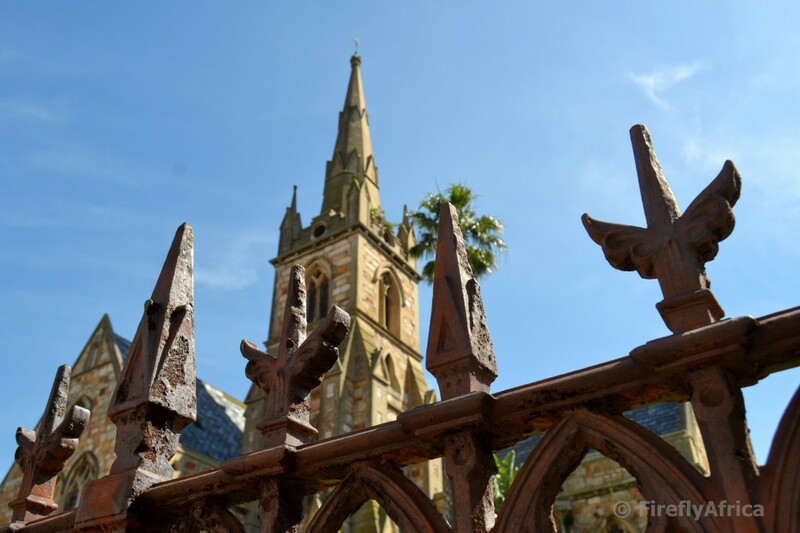 The old fence on the wall around the Holy Trinity Church in Central has always fascinated me and it makes for a nice foreground for photos of the church as well. 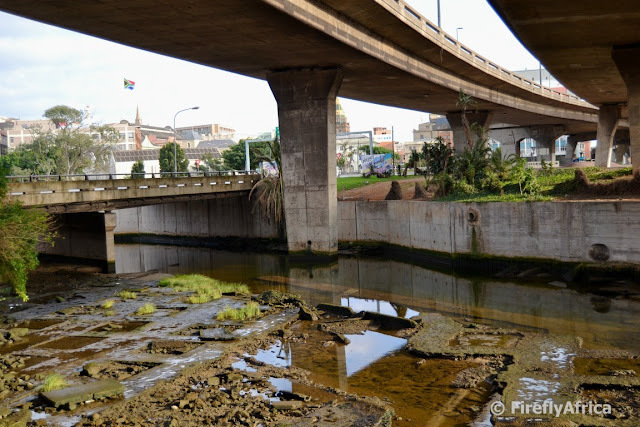 It's sad to think that the Baakens River mouth was once a big lagoon where passing ships came to collect fresh water for their voyages yet today it's a cement canal under the Settlers Freeway which flows into the PE Harbour. Some major revamping and restoration needed to give this river mouth any dignity again. Port Elizabeth can't boast with Jacaranda Trees flowering so beautifully around town in Spring as Pretoria and Bloemfontein can, but I just luuuvvveee all the Coral Trees flowering around the city. It turns out that the Voting Line on the Donkin Reserve isn't just made up of interesting and diverse silhouettes, it also throws the most interesting shadows. The woman with the chair, Anton Momberg's Untitled art piece forming part of Route 67, looks across the Donkin Reserve towards the Donkin Lighthouse and Pyramid. This past week I posted two posts featuring the historic St Mary's Cemetery at the bottom of the Baakens Valley. 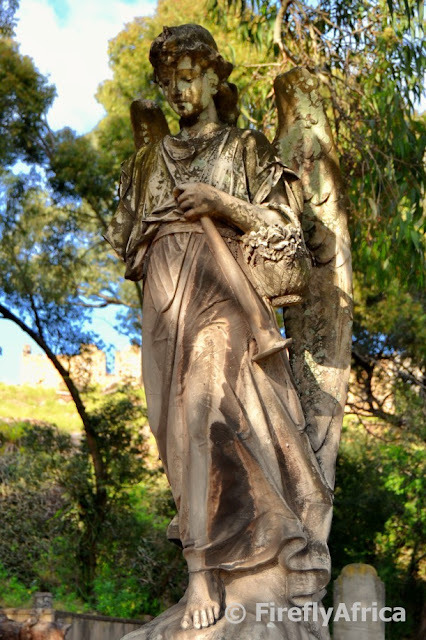 There are so many interesting bits to photograph in a cemetery like this one of what looks like such a sad angel. Last week's Video Friday post was a video featuring mountain biking in the Baakens Valley. Following that post I found another video about mountain biking through the Baakens Valley and seeing that it's such an awesome mountain biking venue I decided to post it as well. While walking in the Sardinia Bay Nature Reserve last weekend I realised that you don't need to travel to the West Coast to see flowers. 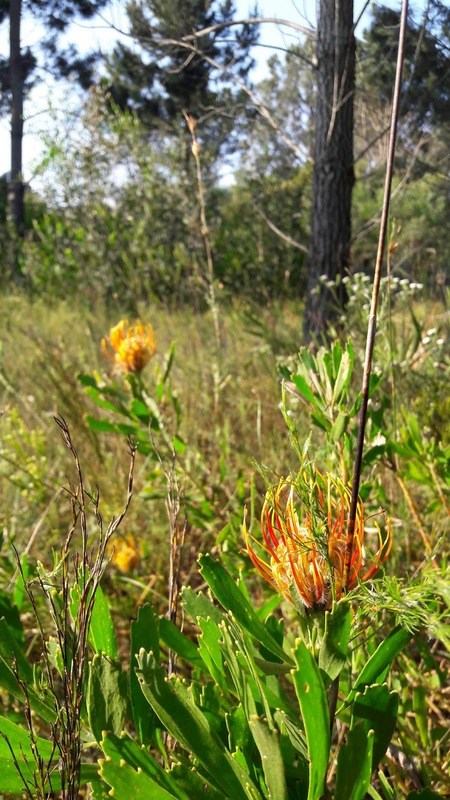 We also have a huge variety of wild flowers in bloom during spring. We may not have the quantity but we definitely have the variety and the beauty. 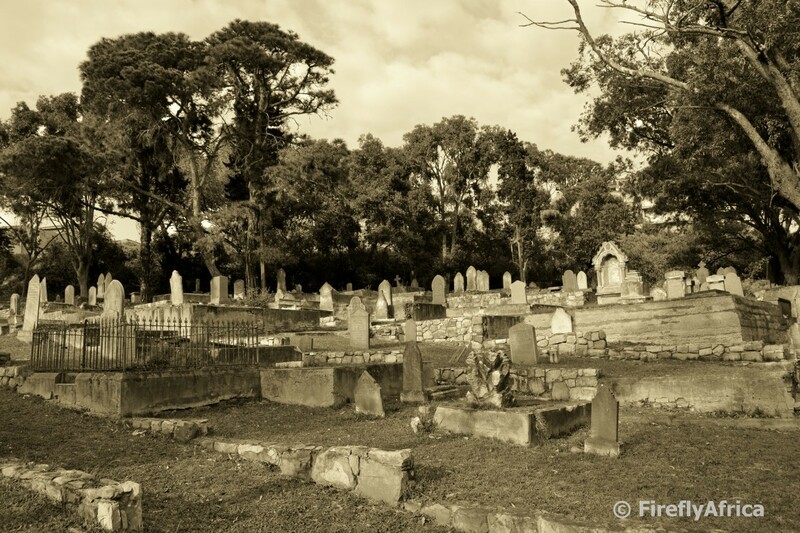 Yesterday I posted a photo of the St Mary's Cemetery along with the grave yard's history. I decided to follow it up with another photo of the cemetery but from a totally different angle. This one is standing at the bottom and looking away from the road and up the terraces. 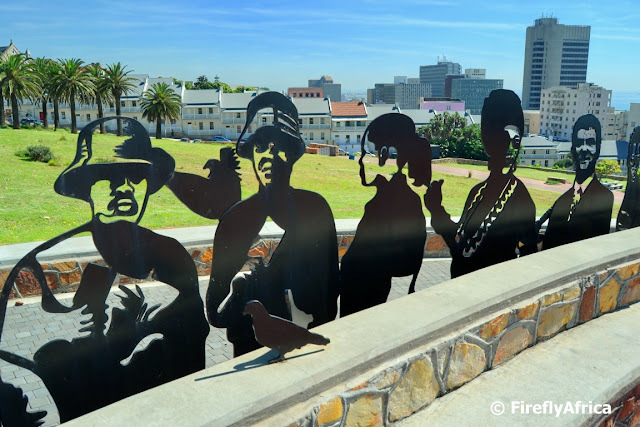 I got to attend Nelson Mandela Bay Tourism's launch of Tourism Month at the newly refurbished Tramways Buildings a week or two ago and had some time on my hands before the event began so went for a walk through St Mary's Cemetery. It's really sad to see the state the cemetery is in specially seeing the historic value and position it has. I went scratching for the history around the cemetery and this is what I cam up with. In 1799 when Fort Frederick was being built, the military authorities laid out a burial ground to the south of the Baakens River. After the foundation of the town which was to become Port Elizabeth, civilian burials appear to have taken place on a site to the north of the settlement. After the arrival of the 1820 British Settlers which brought an influx of people into the town, arrangements were made for civilians to share the military cemetery. Control of the cemetery was assigned to the colonial state church, the Church of England, in the charge of St Mary's Collegiate Church, and for several years also accommodated other Christian denominations within its walls. The one major group which could not be included was the Cape Malay community, whose members were Moslems. Thus adjacent to the Anglican cemetery a separate Muslem cemetery was laid out with a orientation facing Mecca. The precedent for the separation of place of worship from place of burial once established, was to be followed virtually throughout the city's history. 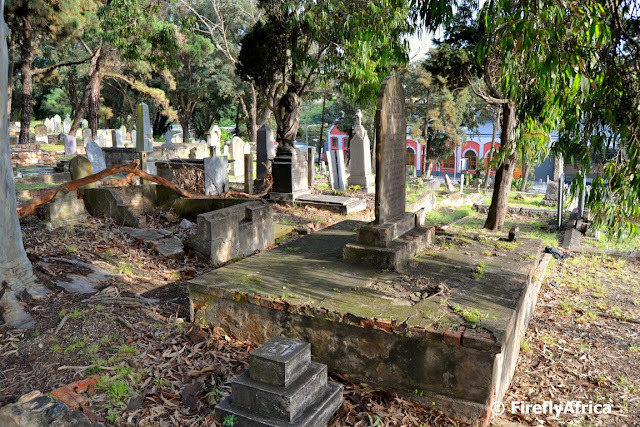 The growth of the town and the diverse religious affiliations of the inhabitants were such that increased demands were placed upon St Mary's Cemetery. The solution was found in the allocation of small pieces of land on the town margins to accommodate the various Christian denominations. In the late 1830's and 1840's the Wesleyan Methodists, Roman Catholics and Congregationalists were all granted their own burial grounds to the north-west of the settlement. The Voting Line on the Donkin Reserve is on of my favorite art pieces forming part of Route 67. Most people usually photograph them from the other side but this time I wanted to include the row of Donkin Houses in the background. Built in the mid 1800's the houses have recently been refurbished, forming part of a very exciting new business hub developing in the inner city. After a morning of mowing the law and doing some things around the house I headed out for a spot of Geocaching this afternoon. 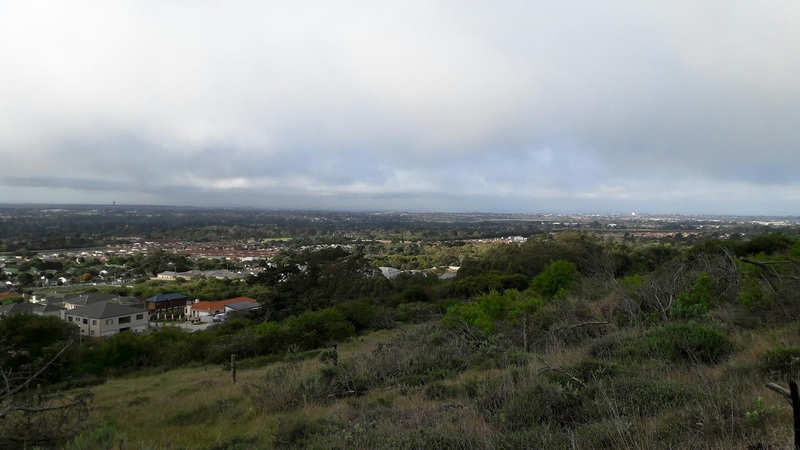 Rather than just doing a few park and grab caches, I opted to go for a walk in the Sardinia Bay Nature Reserve and pick up a series of 12 caches that I've been wanting to do for a while now. The caches in question aren't on the regular trails but rather higher up in the reserve along a track used mostly by horse riders and the municipality to access the overhead electricity lines. I did about 5 km from Victoria Drive close to Schoenies all the way to Sardinia Bay road without seeing another soul. Pure bliss. 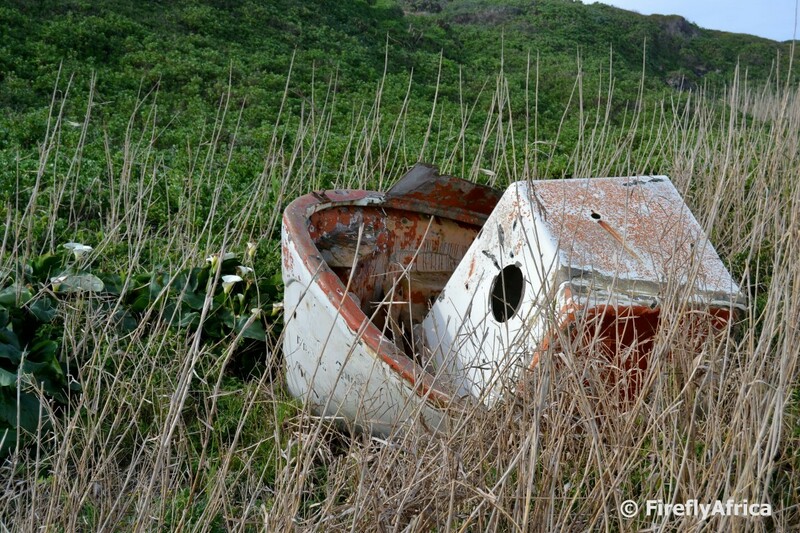 Every year thousands of people worldwide pitch in and do their bit on International Coastal Cleanup Day. Anualy thousands of tons of garbage winds up in the oceans, with 60% of that being composed of plastic material. Plastics especially last a very long time in the ocean, and are in such abundance that there are 46,000 individual pieces of plastic litter for every square mile of ocean. Plastics are very hazardous to marine life, killing more than a million birds and over 100,000 seals, turtles, and whales, and an immense number of fish in our ocean. This year most of Port Elizabeth's beaches were included with teams of volunteers setting off all along the coastline from early morning. 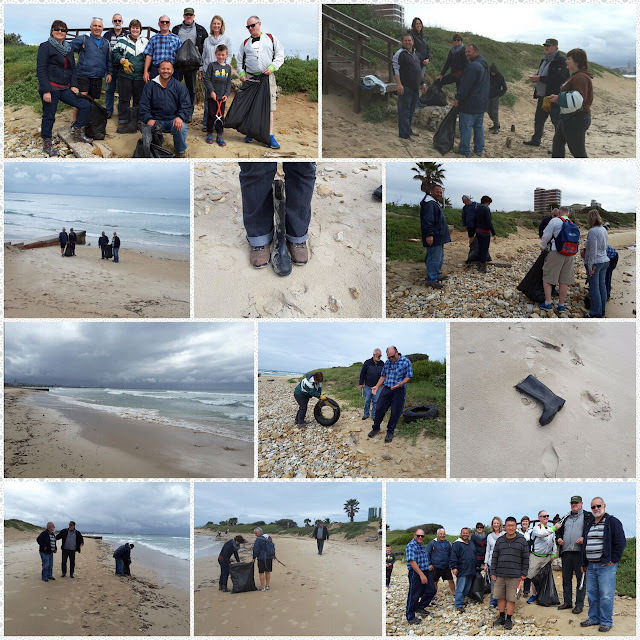 The local Geocaching community also got into the swing of things and cleaned up a section between Hobie Beach and Pollok Beach as part of a CITO (Cache in Trash out) event that was organised by Kitchenboss. Unfortunately I couldn't make it this year but Mrs Wikkelgat had her camera as usual and I'm borrowing her collage of pictures to share with you. We are so fortunate to have the Baakens Valley green belt running through Port Elizabeth. 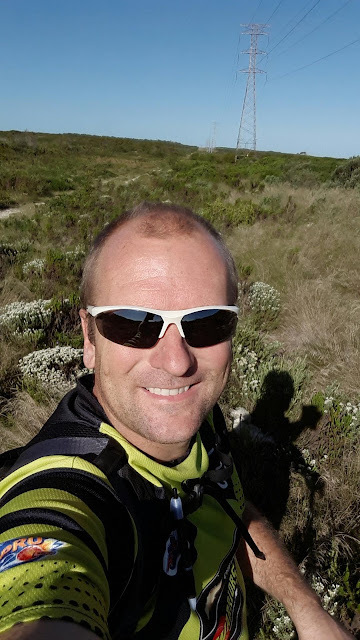 The area truly has the potential to become a prime outdoors activities part of the city and already is very popular with mountain bikers and trail runners. When I found this great video on YouTube showing off the great trails through the valley I just had to share it with you. 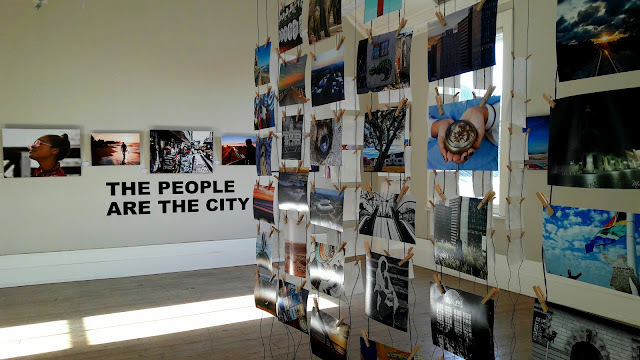 I did a presentation at a SACCI meetings at the Athenaeum in Central this morning and grabbed the opportunity to go and have a look at the Share the Bay through your lens exhibition currently on in one of the exhibition rooms. Share the Bay through your lens is an exhibition hosted by Nelson Mandela Bay Tourism and Colours of You SA and features photos taken in the city by local photographers and Instagrammers and runs the length of September as part of Tourism Month. I couldn't find any of my own photos although I'm sure I used the tag during the entry period. Perhaps not. Who knows. You get to see my picture here anyway. *Big grin* Anyhow, if you have a few minutes on your hands, do pop in at the Athenaeum for a look. The pictures on show are stunning. This is a public service announcement... of some sort. The need for blood is real and at any time the blood bank only has a few days worth of blood in stock. It shouldn't be necessary for special appeals to go out every time the holidays come round or something happens where somebody needs blood urgently. 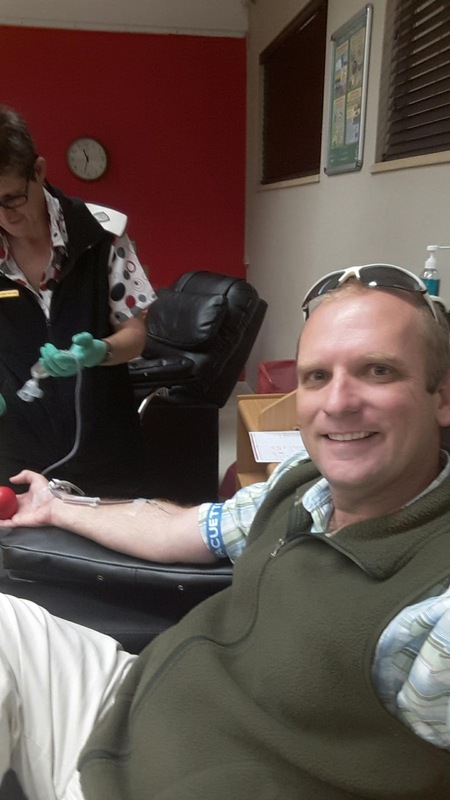 All of us who are able to donate blood should be doing so on a regular basis which means at least 4 times a year, Today I donated blood for the 65th time and the fourth for the year. I'm a regular donor and you? Driving around Richmond Hill last week I just couldn't help but to stop in front of St Phillips for a photo. 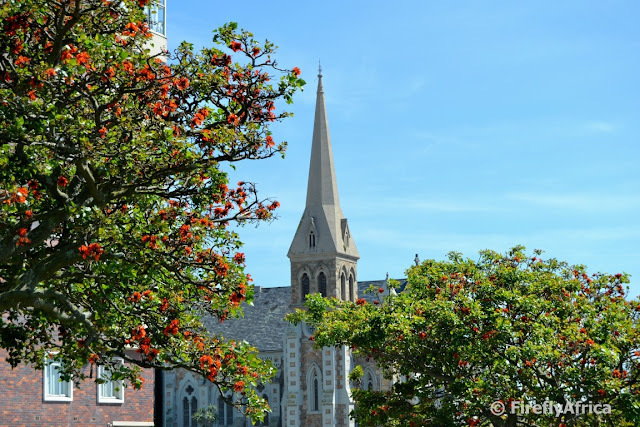 When Sue and Max started Port Elizabeth Daily Photo St Phillips was featured quite often as they live nearby. Me on the other hand live across town and don't get to come here that often. Want to know more about the history of the church? Just click the link for a post from last year. I sometimes think I don't do nearly enough urban photography. I was waiting for a meeting in Richmond Hill last week and went for a quick walk around the block with my camera and snapped this pic looking across towards Central and the Donkin Reserve. I really like the mix of urban and nature with the flowering Coral Tree. I went Geocaching in Lorraine this afternoon and had to follow a trail into the bush in the area to go and find a cache up a tree. You can see it is spring by the amount of wild flowers in bloom and I specially liked these Pincushion Proteas close to the cache location. 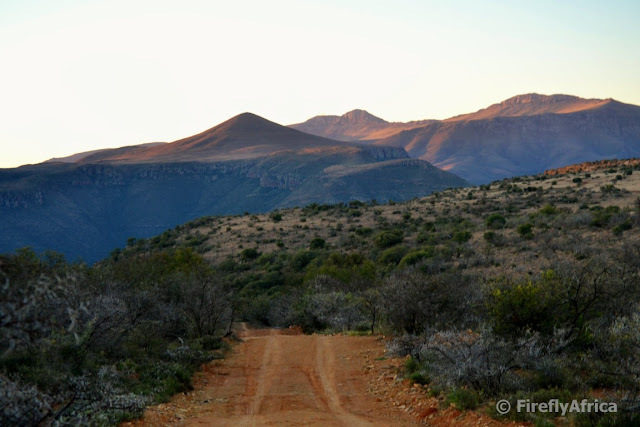 A weekend or two ago I found myself spending a night at Mount Camdeboo Game Reserve outside Graaff-Reinet before an early morning meeting. What is spending time on a game reserve without a game drive so we headed out for a drive late afternoon. The road took us right into the mountains on the reserve and how can one not prefer this over the busy rush of city traffic? 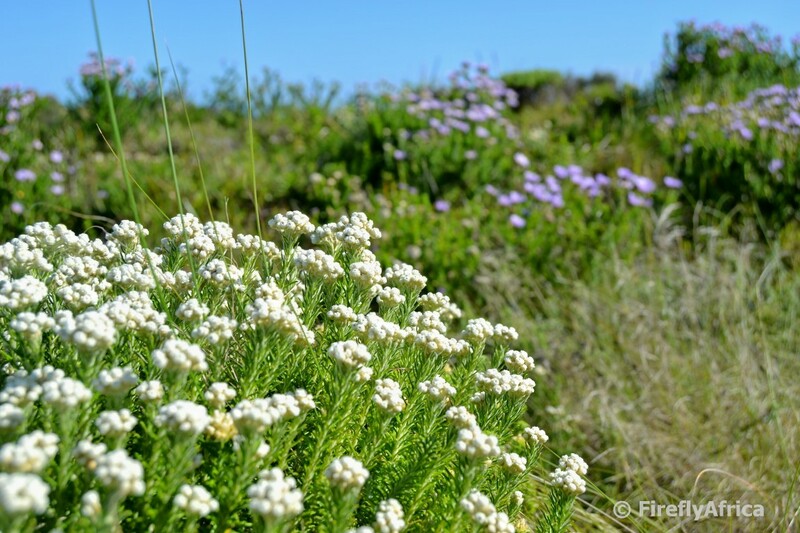 Last week I posted the new promotional video for the Greater Addo and Sundays River Valley area. This week I want to present to you the new video for the Karoo Heartland which covers the towns of Somerset East, Cradock, Middleburg, Nieu-Bethesda, Graaff-Reinet and Jansenville. The perfect weekend breakaway from Port Elizabeth and truly a place where the land meets the sky. It's been a few years since I've been down to the remains of the Oceanos lifeboat at Schoenies, so last Sunday I decided to head on over and take a walk down for a change again. 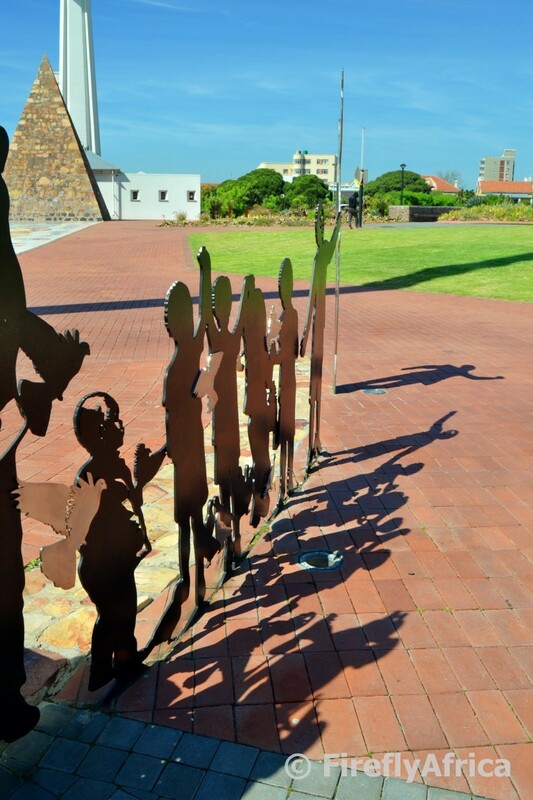 4 August 1991 was a dramatic and fateful day on the Eastern Cape coastline with the sinking of the MTS Oceanos on the Wild Coast close to Coffee Bay, east of East London. After all 571 passengers on board were rescued, some of the lifeboats floated south-west along the ocean currents with one of them washing up on the coastline at Schoenmakerskop. It landed up on the rocks in a marshy area on the eastern side of the village and has become fairly overgrown over the years. Nearby vessels responded to the ship's SOS and were the first to provide assistance. The South African Navy along with the South African Air Force launched a seven-hour mission in which 16 helicopters were used to airlift the passengers and crew to nearby settlements. All 571 people on board were saved with a group of entertainment staff, under the leadership of Moss Hills, organizing the orderly evacuation of passengers by the helicopters. The shipwreck is possibly the most recent instance where women and children were given priority when loading the lifeboats. The entertainers were the last of the passengers lifted off the ship. 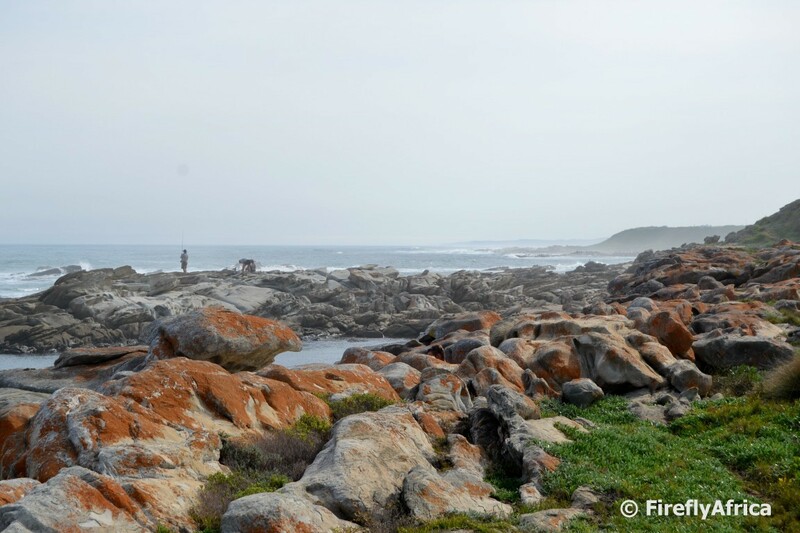 Frederick Korsten, a Dutch entrepreneur, came to Algoa Bay in 1810 and over the following years established himself as a merchant, farmer and owner of a whale fishery. 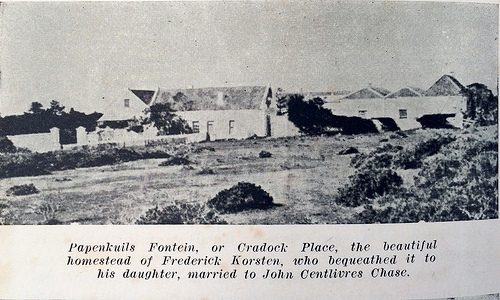 In 1812 Korsten purchased a farm called Papenkuilsfontein from Thomas Ignatius Ferreira and named it Cradock Place after Sir John Cradock who was the Governor of the Cape Colony from 1811 until 1814. 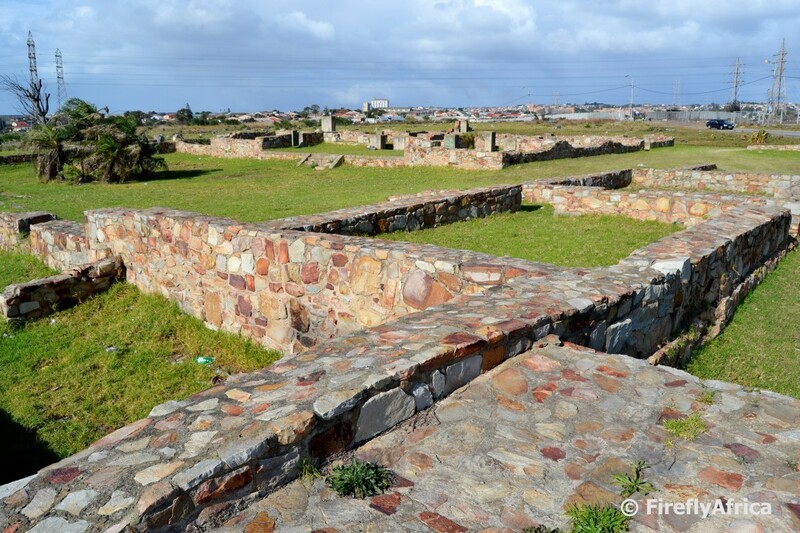 The farm changed the commercial landscape and economic future of Algoa Bay dramatically during the 1800's. 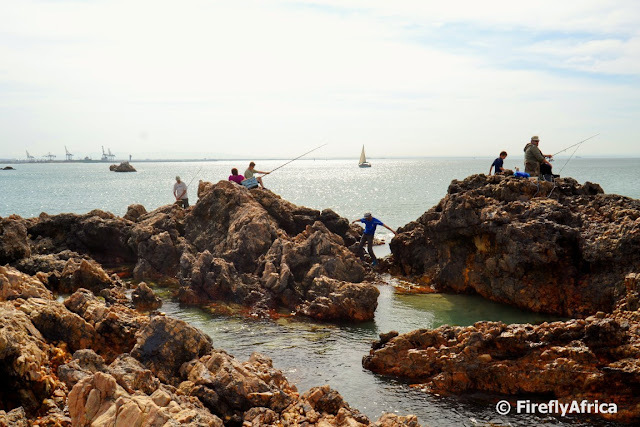 It also became the social centre for well-to-do visitors to Algoa Bay with some of the guests including Cape Governors of the day, French scientists, a Zulu delegation sent by Shaka, as well as the well-known traveler-artist Thomas Baines. Frederick Korsten passed away on 16 June 1839 at the age of 66 years and bequeathed the farm to his daughter who was married to John Centlivres Chase. Chase wrote a book called "Old Times and Odd Corners" that documented the history of the estate. 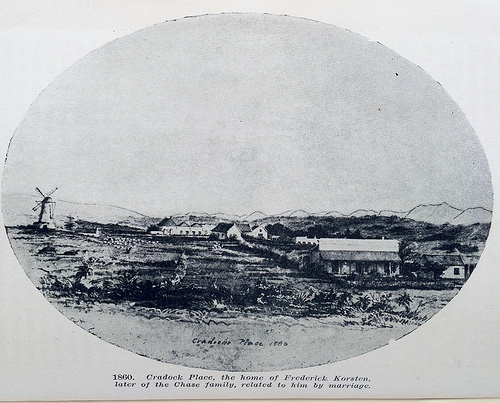 Korsten was buried on the farm and it is said that the cemetery and family mausoleum were at some considerable distance north-west from the house, roughly where Stanford Road and the Papenkuils River run closet to each other today. Unfortunately the farm was later ravaged by misfortune and sorrow. 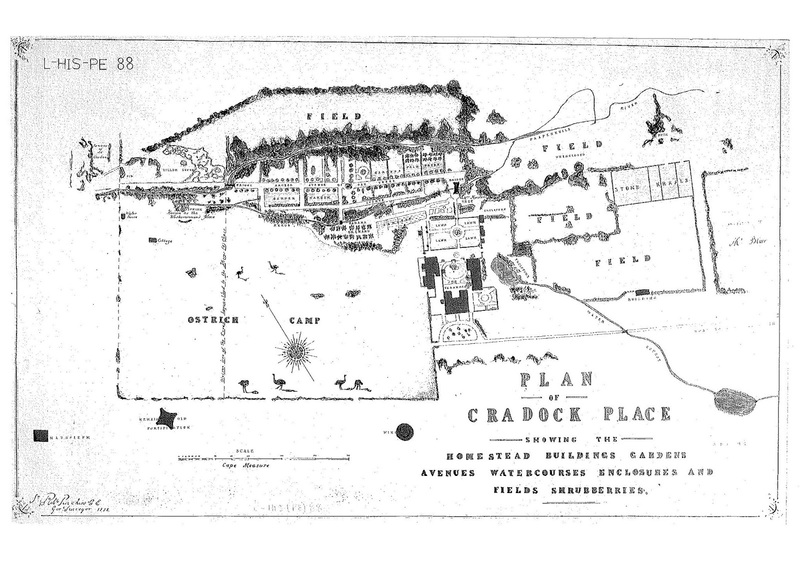 The end of Cradock Place started with a devastating flood followed by a fire that totally destroyed the homestead on 13 March 1909. At that stage the farm was no longer owned by the family. Urban expansion which has accelerated in the area and extensive vandalism means very little is left of Korsten's commercial legacy. 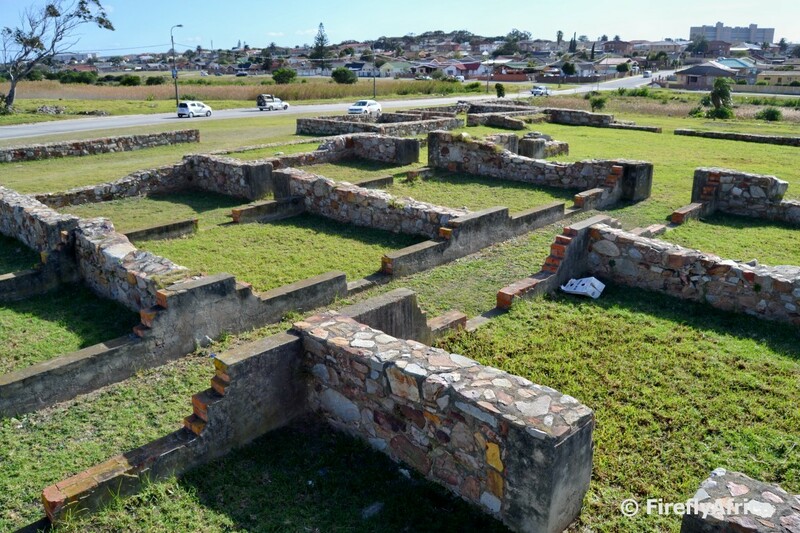 Today only the foundations of the buildings remain next to the road between Algoa Park and Young Park. At least it seems the municipality is keeping the grass cut around the foundations. I'm not a fisherman not an angler. I just don't have the patience for it. What with a spot of ADD in the middle age now that I've been called middle aged on a public platform. But do you know the difference between an angler and a fisherman? Apparently fishermen actually catch fish while anglers are the type of guy who just likes to sit next to the water with a rod in his one hand, a beer in the other and enjoy being there. Or something like that. I'm not sure if the guys on the rocks below Something Good last Sunday were the former or latter, but they did choose a nice warm winters day to be out there. 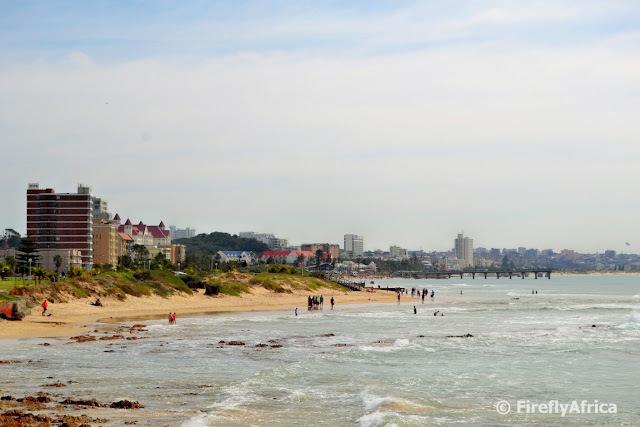 One of the things that Port Elizabeth and Nelson Mandela Bay is very proud of and which gets promoted by Nelson Mandela Bay Tourism often is that the metro has 40 kilometers of beautiful white sandy beaches ideal for swimming, long walks and building sand castles. But what is in between because the metro has about an eighty kilometer stretch of coastline from Van Stadens River mouth to Sundays River Mouth when you exclude the area covered in dolosse between the harbour and just short of Swartkops? A rugged coastline roughly from Cape Recife to Maitland (with the exception of the Sardinia Bay area) via Willows and Schoenies known as the Wildside. The Wildside is ideal for hiking, fishing, exploring between the rocks with the kids, swimming in rock pools, snorkeling in gullies, picnics between the boulders, sunbathing away from the beach crowds and so much more. 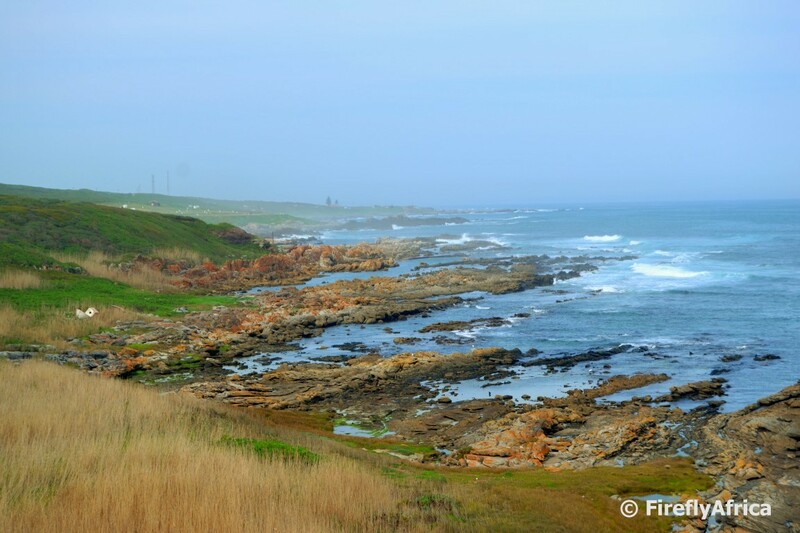 A stunning coastline to enjoy and be proud of. I went for a walk on the hillside above Kamma Heights yesterday in search of a Geocache and some alone time and this is the view that greeted me from the cache location. I had 30 minutes on my hands yesterday afternoon and did a quick detour to Mangold Park to find a new Geocache on the edge of the Baakens Valley. From the parking coords at the bottom of a cul-de-sac there were two paths splitting off. A paved one to the right which I had to follow to find the cache and the one in the photo to the left. Obviously the call of the cache was strong andf I hurried down to do it, but on my way back I took a sharp right onto the path. 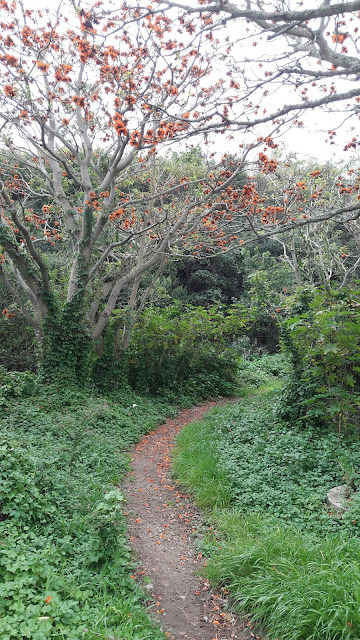 The narrow path surrounded by green undergrowth and leading under a number of flowering Coral Trees was just too inviting not to take. It is normally used by mountain bikers but definitely one that is probably a nice little excursion for trail runners and casual strollers as well. The brand new destination promotion video for the Sundays River Valley and Greater Addo area have recently been released by Addo Tourism and ECTOUR showing how stunning this area right on Port Elizabeth's doorstep is. It also illustrates what I'vebeen saying for a while now, that Addo is a fully fledged destination now and so much more than just elephants. Please share it around on social media if you enjoy it. We are really privileged here in Port Elizabeth that we have so little over development along the beachfront. No heavy traffic congestion and narrow roads like in Durban or lack of parking like Cape Town. Our beaches are generally clean and driving along Beach Road and Marine Drive you can keep one eye on the sea. I love Port Elizabeth.